Lili Alessandra embroidered pillows exude an old world charm. The Mirrors collection marries tiny mirrors with intricate embroidery on linen for a unique collection of decorative pillows and a throw. Available in three colorways: Straw, Fawn and Seafoam. 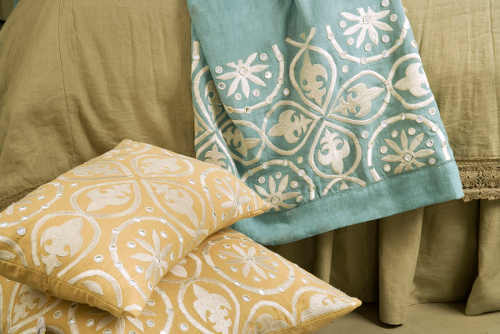 See the complete Lili Alessandra collection of pillows, bedding, drapery panels and more on DefiningElegance.com.